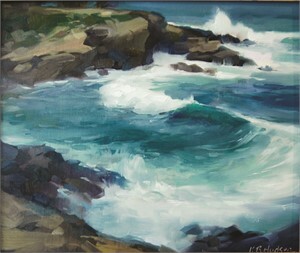 Kathleen B. Hudson Kathleen B. Hudson lives and paints in Lexington, KY, where she has a studio at Artists' Attic. 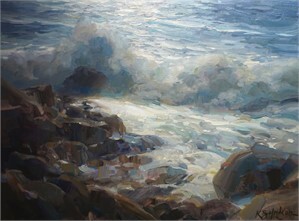 Hudson is a Signature Member of the American Society of Marine Artists and an Artist Member of the Copley Society of Art in Boston, MA. 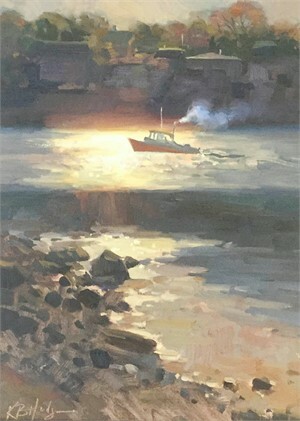 In 2017, Hudson received the Grand Prize in the 6th Annual PleinAir Salon for her painting Bright Morning, Timberline Falls, which was featured on the July 2017 cover of PleinAir Magazine. The same month Southwest Art named her an "Artist to Watch." Hudson moved from her native Kentucky to Boston in the fall of 2005 to begin an undergraduate degree at Harvard University. During her years in Boston, Hudson came to love the beautiful New England landscape as she painted, studied mountain travel narratives, and led backpacking trips for fellow students. After graduating, she was selected to join Boston’s Copley Society of Art, the oldest non-profit art association in America. 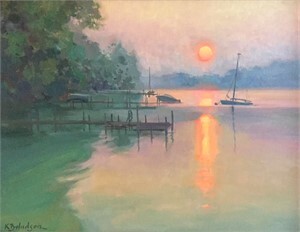 In 2013, Hudson returned to her hometown of Lexington and began to take part in regional plein air painting festivals. She now undertakes several national juried competitions each year, and when she's not outside painting from life, you can find her in the studio creating larger scale landscapes that emphasize the dynamic interplay of light, shadow, and atmospherics.